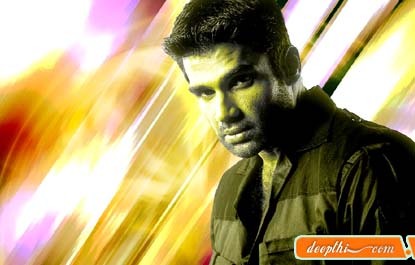 Sunil Shetty, one of the few macho men in the Bollywood, was born on 9th Aug. He started his debut in 1992 with Balwann opposite Divya Bharati. Sunil Shetty, the Leo man, is best known for his style in thrills - the way he manhandles the villain group and executes the fights. And he's known for his gentlemanly attitude off the screen too. So after a long barren spell at the box office when around 21 out of his 28 films flopped miserably, Shetty finally salvaged his dwindling career with films like Mohra and Border. Then the resounding success of Priyadarshan's Hera Pheri gave his career a new lease of life while Refugee and Jungle has got him on cloud nine. One of the promising stars to have hit the silver screen in the last decade Sunil Shetty stays clear of petty politics of the tinsel world and maintains a low profile. For this reason perhaps he has the choicest projects in his kitty despite his innumerable debacles at the box office. And off the screen, he has quite a happy home with his wife "Manna" and the two children "Atiya" and Aahan". Deewane Hue Pagal ( Akshay Kumar, Sunil Shetty, Rimi Sen, Shahid Kapur, Paresh Rawal), Chocolate ( Anil Kapoor, Sunil Shetty, Irfaan Khan, Arshad Warsi, Tanushree Dutta, Emraan Hashmi, Sushma Reddy), Dus ( Sanjay Dutt, Sunil Shetty, Shilpa Shetty, Abhishek Bachchan, Zayed Khan, Esha Deol), Paheli ( Shah Rukh Khan, Rani Mukherjee, Juhi Chawla, Amitabh Bachchan, Sunil Shetty, Anupam Kher), Blackmail ( Ajay Devgan, Sunil Shetty, Priyanka Chopra, Dia Mirza), Padmashree Laloo Prasad Yadav ( Sunil Shetty, Mahesh Manjrekar, Johnny Lever, Masumeh Makhija), Ek Se Badhkar Ek ( Sunil Shetty, Shekhar Suman, Raveena Tandon, Isha Koppikar, Gulshan Grover), Rakht ( Bipasha Basu, Sanjay Dutt, Dino Morea, Neha Dhupia, Sunil Shetty, Amrita Arora), Tango Charlie ( Sanjay Dutt, Sunil Shetty, Bobby Deol, Ajay Devgan, Tanishaa), Aan - Men At Work ( Akshay Kumar, Sunil Shetty, Shatrughan Sinha, Paresh Rawal, Irfaan Khan, Jackie Shroff, Raveena Tandon, Lara Dutta, Preeti Jhangiani), Main Hoon Na ( Shah Rukh Khan, Sunil Shetty, Amrita Rao, Naseeruddin Shah, Sushmita Sen, Zayed Khan), Lakeer ( Sunny Deol, Sunil Shetty, John Abraham, Sohail Khan, Nauheed Cyrusi), LoC Kargil ( Abhishek Bachchan, Ajay Devgan, Akshaye Khanna, Sanjay Dutt, Saif Ali Khan, Sunil Shetty, Manoj Bajpai, Sanjay Kapoor), Khel ( Sunil Shetty, Ajay Jadeja, Celina Jaitley, Sunny Deol), Qayamat ( Ajay Devgan, Neha Dhupia, Sunil Shetty, Arbaaz Khan, Sanjay Kapoor, Isha Koppikar), Baaz: A Bird in Danger ( Karisma Kapoor, Jackie Shroff, Sunil Shetty, Dino Morea, Preeti Jhangiani), Karz ( Sunny Deol, Sunil Shetty, Shilpa Shetty), Annarth ( Sunil Shetty, Preeti Jhangiani, Sanjay Dutt, Ashutosh Rana, Shweta Menon), Jaani Dushman ( Manisha Koirala, Akshay Kumar, Sunny Deol, Sunil Shetty), Awara Paagal Deewana ( Akshay Kumar, Sunil Shetty, Aftab Shivdasani), Kaante ( Amitabh Bachchan, Sanjay Dutt, Sunil Shetty, Lucky Ali), Ehsaas ( Sunil Shetty, Neha, Mayank Tandon), Yeh Teraa Ghar Yeh Meraa Ghar ( Sunil Shetty, Mahima Chaudhary, Paresh Rawal), Border ( Sunny Deol, Akshaye Khanna, Sunil Shetty, Jackie Shroff, Pooja Bhatt, Tabu), Pyar, Ishq aur Mohabbat ( Sunil Shetty, Aftab Shivdasani, Arjun Rampal, Kirti Reddy), Officer ( Sunil Shetty, Raveena Tandon, Danny Denzongpa), Kuch Khatti Kuch Meethi ( Kajol, Sunil Shetty), Aghaaz ( Sunil Shetty, Sushmita Sen, Namrata Shirodkar), Dhadkan ( Sunil Shetty, Akshay Kumar, Shilpa Shetty), Jungle ( Fardeen Khan, Urmila Matondkar, Sunil Shetty), Hera-Pheri ( Akshay Kumar, Sunil Shetty, Tabu, Paresh Rawal).